Welcome to One Stop Electric Motor Repair • One Stop Electric Motor Repair Inc.
We will provide all your technical needs for Motor Repair. From AC & DC motors to Coils we can provide you with the best Rewinding needs available. Do you need a New Motor? 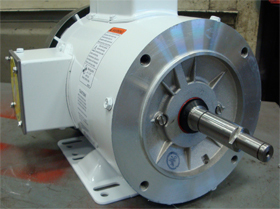 We have a wide variety of motors available for all your motor needs. We provide electric motor repairs, electric motor rewinds, custom controls and panels, systems integration, pump services, machine rebuilds, hydro services, safety-related services, energy efficiency solutions, and diagnostic services for the commercial and industrial industry. For the past 15 years I have been a customer of theirs and during this period I have never been disappointed with any service they have provided here to us at High Steel. One Stop is truly one stop for us. One Stop stands behind their workmanship and warranty repairs. They are quick to respond to emergency issues and provide onsite repairs. "There knowledge of motors and equipment is impressive"
One Stop Electric has in stock Surge and Boumatic replacement motors.